Greg Sanders, a senior biologist for Minerals Management Service, knows that even scientists have trouble identifying a sea otter. Sanders, a graduate of UC Santa Barbara who has also worked with U.S. Fish and Wildlife, was once summoned to San Nicolas Island to autopsy an otter and found the dead animal in question was actually a harbor seal pup. 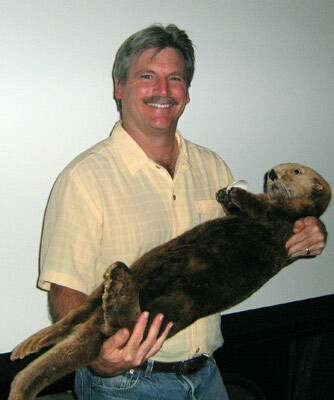 His lecture “Sea Otter Tales Fact and Fiction,” earlier this month at the Santa Barbara Maritime Museum aimed to educate the public about sea otter biology and behavior as part of the Shore to Sea Lecture Series. Sanders surprised his audience of marine wildlife enthusiasts, many of them members of the Channel Islands Naturalist Corps, with several instances of otter ignorance by educated people. He projected a hopelessly inaccurate sea otter drawing by naturalist John James Audubon. The animal depicted holds a large fish (dietary inaccuracy), exhibits ferocious fangs (dental inaccuracy), and stands on its haunches against a rock (inaccurate posture). Shockingly, his artwork was recently used at the Smithsonian to model the pose of a stuffed otter for an exhibit. Clearly, even experts have a lot to learn about sea otters. A sea otter lives an average of 15 to 20 years before falling victim to disease or shark attack. Dental issues are another problem, as otters often severely wear down their teeth by gnawing on rocks and eventually cannot feed. Curiously, toxoplasmosis, a parasite found in cats, is a leading cause of death. It is unclear how sea otters get infected. Some speculate that kitty litter flushed into the sewer systems eventually carries the parasite out to the otters’ marine habitat; others believe the cause is waste from wild felines like mountain lions who live near the coast. Sanders also discussed the methods scientists use to study otters, including otter trapping techniques, which he confessed took him a year to master. (A diver with a trap is guided by radio directions from his colleagues watching the scene from a nearby boat.) Scientists can surgically implant instruments in an otter’s abdomen, which allow them to gather information about otter behavior, such as diving depth. Since sea otters stay relatively close to shore, marine scientists also observe them from land using telescopes. Captive otters who cannot be successfully rehabilitated are also an important source of information. These darling “teddy bears of the sea,” as Sanders called them, are not without controversy. He acknowledged that fishermen are right to say the animals eat an awful lot, especially of the sea urchin population. Sanders claimed that while otters’ appetites changes the numbers of individuals in prey species, it does not put those species in danger of extinction.